Babblings of a Mommy: Lanvin Launches Childrenswear. But, Lanvin has decided to release a collection that will reflect the label's "super-luxury approach" and will comprise of 25 pieces for girls aged between 4 to 10. The collection is set to include dresses, T-shirts, coats, jumpers and accessories, and will be sold in 80 Lanvin stores across the world. Prices are yet to be confirmed, but it is said that the fabric used, will be 10 times more expensive than those typically used to create children's clothing. Geez, can you imagine? 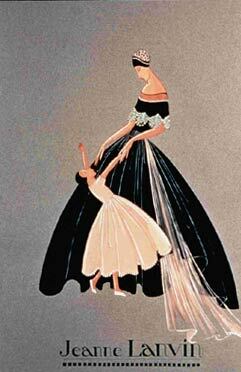 Apparently, this was all Jeanne Lanvin's vision when she founded the fashion house in 1909. It is said that she was known for creating beautiful childrenswear and sketched clothes for a young demographic until 1935. The painting above is of Madame Jeanne Lanvin and her daughter.